Valentin Rathgeber was a very successful composer in Germany in the first half on the 18th century. He was born in Fulda, studied theology in Würzburg, where he also became a schoolmaster and an organist. In 1707 he entered the seminary at Banz as a chamber musician, and here he was ordained in 1711. In the same year he was appointed choirmaster, a post he held until his death. As a composer he concentrated on writing sacred music for churches which couldn't afford professional singers and players. His music is melodious and technically undemanding. As result his compositions enjoyed wide dissemination in Germany, in particular in the south. In modern times he is mostly remembered because of his Tafel-Confect, a collection of secular songs and dialogues. These were printed in two volumes in 1733 and 1737 respectively. His sacred music is mostly forgotten, which is probably attributable to its relatively sparse technical requirements. But stylistically his sacred works are important as they are among the very first examples of music which moves away from the learned style of the German baroque. In this respect Rathgeber's oeuvre is a link between the baroque era and the classical era. His compositional ideals were brevity, facility and suavity. These are well reflected in the compositions performed on this disc. 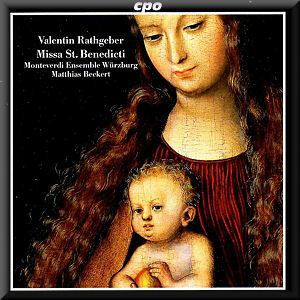 Rathgeber was especially devoted to the Virgin Mary, which explains the large number of compositions with Marian connections. No fewer than four collections refer to the Marian cult: Harmonia Mariano-Musica opus 5 [tracks 6 and 10], Decas Mariano-Musica opus 7, Antiphonale Marianum opus 16 [tracks 2, 4, 5 and 7] and Cultus Marianus opus 18. There is another reason why so many Marian motets have been recorded here. This disc is devoted to Pope Benedict XVI, who also has a special devotion to Mary. This explains why the other pieces on the programme are connected to St Benedict of Nursia, the author of the Rule of St Benedict, sometimes considered the founder of Western monasticism. Two Offertories for the feast of St Benedict open and close the first section of this disc: Laudem virum gloriosum [track 1] and Vir Dei [track 11]. In addition to these and the Marian motets there are two pieces from Rathgeber's opus 11, a collection of 36 Vesper hymns for feasts of the Lord and feasts of saints. Laudibus cives is a hymn for St Benedict, Te Joseph celebrant for St Joseph. Salve Regina and Ave regina coelorum belong to the most frequently set Marian texts. Three settings of each are recorded. We also hear a setting of the Litaniae Lauretanae, whose text probably dates from the 12th century. In 1587 its use in public worship was approved in 1587 by Pope Sixtus V. It is another piece which is connected to Mary. Various names are given to her: Mother of Christ, Mother most pure, Virgin most prudent, Spiritual vessel, Queens of martyrs - and every name is followed by the prayer 'Ora pro nobis' (pray for us). All pieces date from between 1725 and 1736, and they are indeed very different from the sacred music written at that time. There is very little polyphony (mostly in the mass), and the solo episodes are short. Only the first item, Laudem virum gloriosum, contains two da capo arias, for soprano and alto respectively, as well as a recitative for alto. The instrumental ensemble is small: two trumpets, timpani, four violins, cello, double bass and organ. Its most prominent role is in the mass, for instance in the Gloria whose second section opens and closes with an instrumental episode. The two sections of the programme are separated by the Concerto in C, one of 24 concertos which were published as Chelys sonora opus 6 in 1728. This particular concerto is for violin solo with an 'orchestra' in which two trumpets join the tutti violins and the basso continuo. This music may be not technically very demanding, but that doesn't mean that it deserves to be ignored. There are no sensational discoveries here, and the music is not compulsory listening for all every music-lovers. In its relative simplicity it is good music, though, but such repertoire really cries out for a first-class performance. Fortunately that is exactly what we receive here: the four soloists all have very nice voices, and sing their parts immaculately. They are part of the choir, and therefore participate in the performance of the tutti, which creates a compelling sense of unity between the soli and tutti sections. The choir and orchestra are first-rate, but the use of a choir of 17 voices in the tutti is historically questionable. The booklet contains all necessary information about the composer and the music as well as the (Latin) lyrics with German and English translations. A booklet of CPO can't pass without errors – or so it seems: the numbering of the tracks on the pages with the lyrics is a mess.